SOLD! 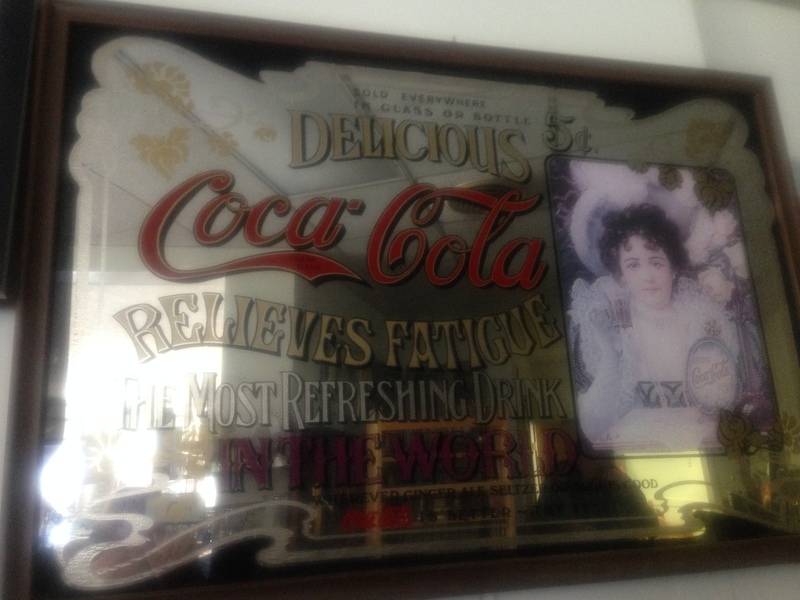 “Delicious Coca Cola Relieves Fatigue…” Mirror for Your Restaurant, Kitchen or Mancave! When one researches “Coca Cola mirror” using either a general search, or on the subscription services we use to price various pieces, one can find all sorts of variations on this mirror. The lettering is in red on some phrases in one variation, and in red on other phrases in other variations of the mirror. Here, the letters “In the World” are in red, which appears to somewhat rarer than the other versions of this mirror. We have no idea if that means this particular one is more valuable than others or if this version just happened to be broken more frequently and therefore not sold… or whatever. I haven’t yet gotten the knack of photographing anything with a glass covering (the glare gets me every time); I particularly have difficulty with mirrors. You’ll have to see this one to decide if it’s for you. Condition: The mirror is in good to very good condition. Price: $24.00. Maine State Sales Tax of 5.5% applies. This entry was posted in Advertising & Iconic Pieces, Mirrors - Vintage, Funky & Contemporary, Western and tagged Coca Cola, coca cola advertising, coca cola mirror, coke advertising, coke mirror, inexpensivehomedecor, mirror, repurposerecycleupcycle, vintage coca cola mirror, vintage coke mirror. Bookmark the permalink.